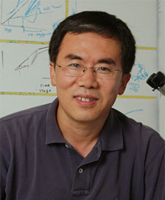 The study began with the work of Cunming Duan (pictured left), professor of Molecular, Cellular, and Developmental Biology at U-M. His lab was studying the growth of zebrafish embryos, in particular the role of cells that import calcium into the body. These cells are found in the intestines and stomach of humans, but they live right on the skin of zebrafish embryos, making them much easier to study. Duan was tracking these cells with a fluorescent marker when he noticed something strange. Zebrafish embryos in normal water (left) and calcium-depleted water (right). The cells that import calcium are marked with black. Note the large amount of cells present in calcium-depleted water. Image courtesy of U-M.
Further research revealed that, in fact, lower calcium levels did cause colon cancer in these embryos. The reason lies in a calcium regulation mechanism that the zebrafish activate when in water with low calcium. Basically, it creates lots more of the cells that import calcium, to better glean what little calcium is available. The drawback is that if the body still does not obtain enough calcium, more of these cells are created and a tumor begins to form. Duan found that this same mechanism is present in humans, which is why extreme calcium deficiency can lead to colon cancer in humans. Biotechnology Calendar, Inc. pays a visit to the University of Michigan each year for its Ann Arbor BioResearch Product Faire™ held annually. The next such show will be held on July 24th, 2014. Biotechnology Calendar is a full service event company that has produced on-campus, life science research trade shows nationwide for the past 20 years. We plan and promote each event to bring the best products and services to the finest research campuses across the country. If you are a university researcher or a laboratory product vendor, consider attending one of our on-campus trade shows; click below to reserve space at the Ann Arbor show or have a look at our 2013 schedule and 2014 schedule.